When Ripoff Week begins, the artists are about to start work on their challenge pieces, but other than their work stations and materials, there isn't much for the public to look at. So we always create what we call a "pre-piece" that will be on display during the week. This is usually done by each artist working in their own medium, and might be a section of the larger work, a different but related piece, or a motif that the master artist used in their work. For example, for the Van Gogh challenge in 2007, every artist did a moon based on one of the several moons Van Gogh painted. When we did Ansel Adams, we each chose one of the other images by Adams that we liked. This year, we're doing something different. 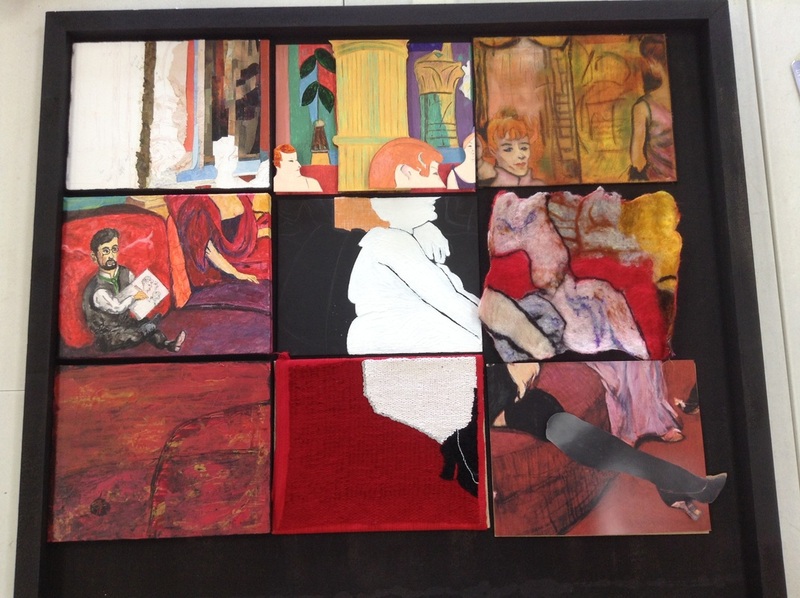 We took a large painting we all loved by Toulouse-Lautrec, Salon of the Rue des Moulins, and divided it into 9 sections. Each one of the 9 artists chose a section, then working alone, they did their own section in their own medium. For the show, these will all be assembled into one large panel. This is the entire pre-piece assembled for the first time, but several panels are incomplete, or will need more work so they can be attached. This gives you an idea of the variety of techniques used (some don't show up well in the photo) and how well they all combine to create the overall image of the original. Techniques used include acrylic, collage, 3-D assemblage, mixed media, woven transparency and wet felting. 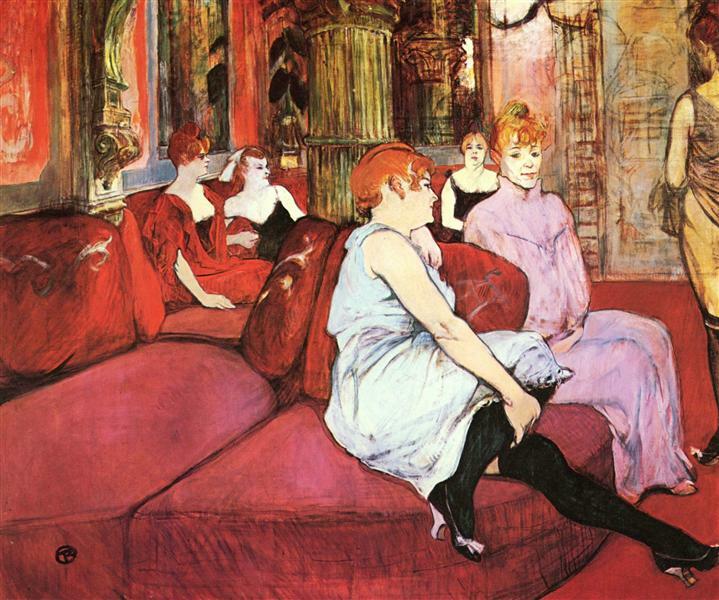 Back to main Toulouse-Lautrec page.